In July 2009, a Brazilian housing finance program called Programa Minha Casa, Minha Vida (PMCMV) (“My House, My Life”) was signed into law. PMCMV’s goal is to create financial mechanisms to encourage the production or renovation of housing units to be sold to households with a monthly income of up to 5,000 Brazilian reais (about $2,300). It is doing this through federally-funded subsidies and tax incentives. From 2009 to mid-2012, PMCMV disbursed $33 billion (at today’s conversion rate), of which R$10.4 billion was subsidies. As of the 2010 census, Brazil had a housing deficit of about 5.8 million units. The government estimates that to “catch up” with current and future demand will require building about 24 million units by 2023. As of mid-2012, about 1.7 million housing units had been contracted, and about 800,000 families had actually moved in to new housing. Beneficiaries must fall within the income brackets served, and priority is given to homeless families, those living in unhealthy or at-risk conditions, female-headed households, and people with physical disabilities. Social services are provided along with the housing. The housing units are built by private contractors. Beginning with President Luiz Inacio “Lula” da Silva’s first term in 2002, federal housing policy in Brazil taken steps to incentivize private contractors to build housing units for lower income buyers, with the intent of stimulating the construction sector and reducing the housing deficit. Previously, most private housing production was geared toward high-income buyers.The government estimates that the program generated 864,000 jobs annually between 2008 and 2012. The general process for the production of units is that the Federal Government sets production goals by region; eligible families register; and construction companies submit their projects to one of two government-owned banks. The financial institutions review and contracts the projects, monitor construction, and make progress payments. The banks also issue specifications for design, including the numbers and dimensions of rooms. For example, the Caixa Economica Federal (CEF) requires that houses include a living room, kitchen, bathroom, laundry area, and two bedrooms. It appears that these specifications are applied nationally, without taking into account family composition, climate, culture, context, transportation, and other factors. So while the Minha Casa, Minha Vida program stands out for the quantity of housing units that have been and will be delivered, how much consideration has been given, and by whom, to the crucial definitions of family unit, dwelling, and transportation and energy efficiency standards? Sergio Magalhaes, who was Rio’s Housing Secretary from 1993 to 2000, and was responsible for implementing the Favela-Bairro favela upgrading program, advocates low-interest credit rather than government-prescribed housing, in order to keep decision-making in the hands of residents, but believes that the subsidy portion of the program is well worth keeping. As Denise Morado Nascimento and Simone Parrela Tostes wrote in 2011, the program needs to be evaluated as well on the quality of the housing produced. Nascimento and Tostes address questions of the assumptions about family units, the design of public space, and concepts of the right to housing as opposed to the production of housing as a pre-packaged consumer good. They suggest that the program doesn’t take advantage of the knowledge about social processes and city fabric that has been gained since Brazil’s last major federal housing program in the 1960s, and the program may even reproduce some of the problems it aims to eliminate. 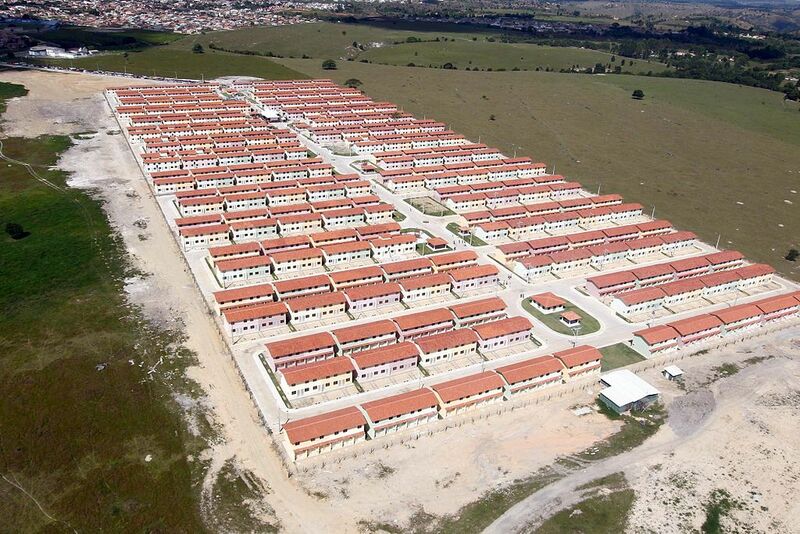 Do a Google image search of “Minha Casa, Minha Vida” to see rows of identical housing units, laid out in a grid, devoid of public spaces or commercial activity.